Frankenstein in Baghdad is Ahmed Saadawi’s third novel (although, as far as I can tell, the first to be translated into English). It won the International Prize for Arabic Fiction in 2014, making Saadawi the first Iraqi writer to win the award. If I’m honest, though, my attention was caught by the title alone. The setting is US-occupied Baghdad. We are quickly introduced to a number of memorable characters, including Elishva, an old woman believed to have special powers, who still longs for her son Daniel to return from the Iran-Iraq war; Hadi, an old junk-seller and teller of tall tales; and Mahmoud, an ambitious magazine journalist. In the first few chapters especially, the view of events overlaps as we go from character to character, so already we get a sense of shifting, unstable reality. When he was twenty yards past the gate, Hadi saw the garbage truck race past him toward the gate, almost knocking him over. A few moments later it exploded. Hadi,together with his sack and his dinner, was lifted off the ground. With the dust and dirt and blast of the explosion, he sailed through the air, turned a somersault, and landed hard on the asphalt. Hadi has been collecting body parts and stitching them together, hoping that the government will give the pieces a proper burial if they’re part of a complete corpse. The corpse, however, has other ideas. The soul of a hotel guard killed by that exploding garbage truck finds a resting place in Hadi’s creation, and it only takes an inadvertent wish from Elishva to animate the body… and soon she thinks Daniel has returned. But then the corpse – soon to be dubbed “the Whatsitsname” – disappears, and gains a gruesome purpose. He is driven to kill those responsible for the deaths of his individual parts. But, whenever the Whatsitsname kills such a person, his corresponding body part disintegrates – and so needs to be replaced, leading to another urge to kill, and so on, and so on. The Whatsitsname becomes a walking cycle of killing for its own sake. This becomes a powerful metaphor for life in the besieged city. It grows even more grimly absurd when the Whatsitsname attracts his own acolytes willing to assist his cause, so ending up at the centre of a cult-of-sorts. But… what if it’s all not real? Saadawi builds enough trapdoors into his novel that the whole business of the Whatsitsname could be false. The Whatsitsname purportedly tells his story on a digital voice recorder provided by Mahmoud, via Hadi – at two or more removes, in other words, with one of those being a notorious liar. Furthermore, the whole book is presented as a text written by an unidentified author and found by a shady government department. The effect of all this is not so much to undermine the Whatsitsname as to reinforce the notion that he’s not needed – all the absurdity, the random killing, can and does go on anyway. Jonathan Wright’s translation is measured in tone, making the supernatural grounded and everyday horrors all the more shocking. I thoroughly enjoyed reading Frankenstein in Baghdad, and it will be my benchmark as I go through the Man Booker International longlist. 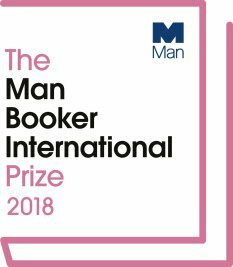 This post is part of a series on the 2018 Man Booker International Prize; click here to read the rest. 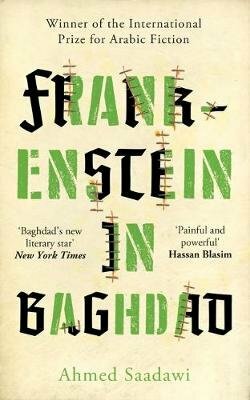 Frankenstein in Baghdad (2013) by Ahmed Saadawi, tr. Jonathan Wright (2018), Oneworld, 272 pages, paperback (proof copy provided for review). Ah, this was one that caught my eye from the longlist too, David. It’s good to hear your thoughts on it. It reminds me a bit of The Corpse Washer, another dark Iraqi novel dealing with the horror of the country’s recent history.